How Do You Solve a Word Problem Using a Proportion? 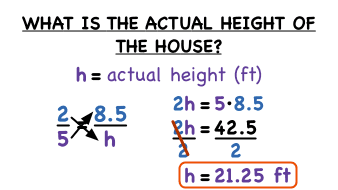 How Do You Set Up a Proportion from a Word Problem? Sometimes the hardest part of a word problem is figuring out how to turn the words into an equation you can solve. This tutorial let's you see the steps to take in order to turn a word problem involving a blueprint into a proportion. Take a look! How Do You Solve a Proportion Using Cross Products? Want to solve a percent proportion? Just use the means extremes property of proportions to cross multiply! Solve for the variable, and you have your answer! Learn how with this tutorial.